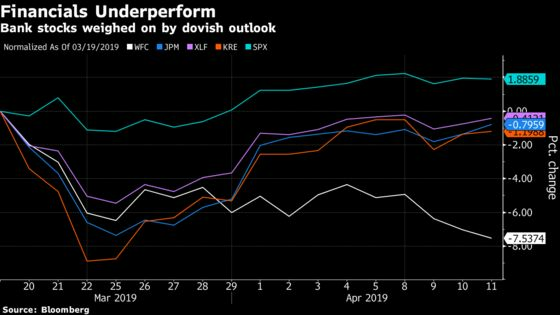 (Bloomberg) -- With big banks poised to kick off the first-quarter earnings season in earnest, investors appear to be favoring options in exchange-traded funds over single stocks to hedge their financial-sector positions. Banks have lagged behind the broader equity market by about 2 percent since March 20, when Federal Reserve policy makers took a more dovish tilt than expected on interest rates. Since then, total options open interest in the S&P Regional Banking ETF, known by its ticker symbol KRE, more than doubled with puts outweighing calls by about 3-to-1. JPMorgan Chase & Co. and Wells Fargo & Co. are set to release first-quarter results on Friday morning. Less than 8 percent of options open interest in each company is set to expire in tandem with the earnings report. The relatively small number of contracts on those individual stocks coincides with outsized interest in options on financial-sector exchange-traded-funds, which have become increasingly popular vehicles through which investors have been hedging their exposure. As a result of the recent underperformance, Goldman Sachs’s derivatives strategists, led by John Marshall, recommended in a note dated April 2 that investors buy bullish call options on the Financial Select Sector SPDR Fund and Bank of America Corp. They highlighted the opportunity after the firm’s prime brokerage data showed institutional investors are underweight financials. While total open interest in the ETF has only increased by 24 percent, call open interest has jumped 70 percent, indicating some traders agree with Goldman’s view. JPMorgan options set to expire Friday imply a 2.7 percent moved in the shares after the release. That compares with a historical average post-earnings move of 1.2 percent over the last eight reports, when declines outnumbered rallies by 6-to-2. Despite the muted expectations, volatility is elevated at 50 percent, versus a three-month historical average of 21. Well Fargo contracts expiring Friday are anticipating a 3.5 percent move in shares, which compares with a 1.9 percent average move over the last eight releases, with declines outnumbering rallies by 7-to-1. Current implied volatility has jumped to 68 percent, about triple the three-month average of 23.